Thomson Reuters is pleased to announce the appointment of Professor Samantha Hepburn as a brand new Natural Resources Section Editor for Property Law Review. As part of an ongoing enhancement project, we are commissioning a range of new sections to bring subscribers property law insights from academics and practitioners around Australia and internationally. Professor Samantha Hepburn has published extensively in the area of property and land law, native title law, natural resource management, mining and energy law and environmental law. She has a strong interest in the environmental and regulatory frameworks that underpin the progression of unconventional gas development in Australia. She has just completed a comprehensive book for Cambridge University Press examining different regulatory and policy aspects of mining and energy law in Australia. She has also just completed an audit performance report for the Auditor-General of Victoria examining the regulatory framework for unconventional gas development in Victoria. Samantha has published in the specific areas of: carbon sequestration rights, carbon capture ownership, unconventional gas regulation, native title jurisprudence and equitable property interests. 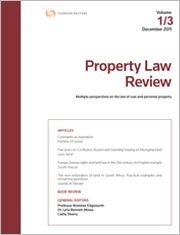 Samantha also published the third edition of Australian Property Law: Cases, Materials and Analysis. This voluminous text is comprehensive examination of the property and land framework in Australia and is prescribed at law schools across the country. Samantha has published scholarly articles in her areas of research in both the United States and Australia. We are delighted to have Samantha join the editorial team and are confident subscribers will benefit greatly from her insights.